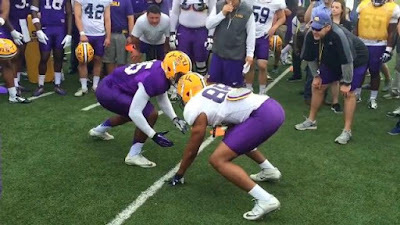 Shirts With Random Triangles: LSU Football "Testifies" In New Spring Practice Hype Video. The video is set to Rage Against the Machine's "Testify." It's an interesting choice, considering the state of Louisiana's recent budget crisis that included the all-too-real possibility of LSU being forced to shut down, endangering the school's 2016 football season due to issues involving player eligibility. LSU will hold its National L Club Spring Football Game on Apr. 16. The SEC Network will air the game beginning at 4:00 PM EDT.